Magnetic Digital Angle Gauge from HF is what I used. With the drive shaft out, just used the yoke as my reference surface on pinion and trans. If you have a smartphone- it's free!!! ENGINE: To measure the engine, put a gauge on the engine (like the valve cover or something parallel to the crank). 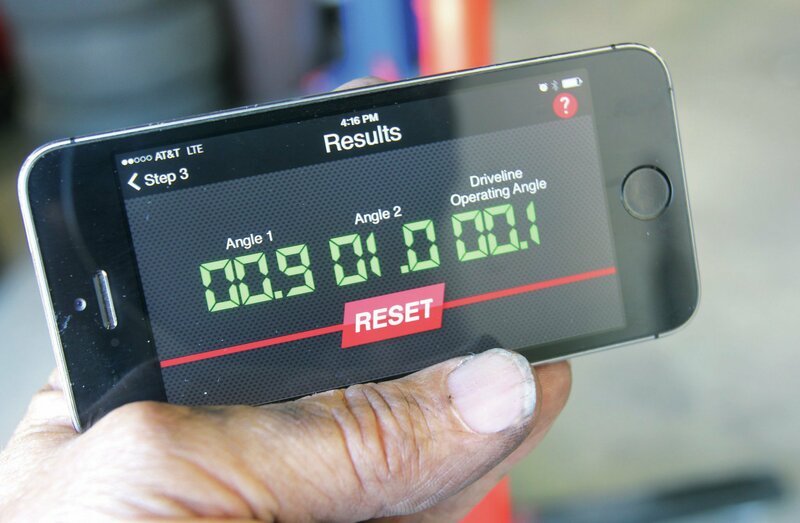 DRIVESHAFT: Put a gauge on the driveshaft. DIFFERENTIAL: You should be able to find some "ears" on the diff case that were machined when they machined cover mount surface. These are inline with the output yokes. They are small but if you put a scale on that and a gauge, you can measure the angle. I just went through this a couple of months ago. I'm interested in what you find. OK, so you saying there is a machines surface on the rear of the main case, where that cover with ears/mounts is attached?? so I ASSume measure X angle , and even with jack under the spring center in back, so I can get under the car....it measures X at the trans, and Y at the diffy, so to ignore the slope with regard to true vertical, which is what the gauges will be revealing.....say I using a metal rule with a bubble float on it, like used in old crude machining work....adjustable square?? so it's the differential between the two I interested in?? they have to match up....so how do I know which way to adjust diffy or trans?? The bolting face of the pinion yoke and trans yoke are perpendicular to centerline of rotation. But require driveshaft removal for access. I don't think bubble levels would be sufficiently accurate. Change the pinion angle by tightening or loosening the bolt to the frame under the pinion, this might require shimming the rubber bushing. They should be close unless the frame is damaged. Also there is about a 1 degree side to side offset between the tailshaft and the pinion. I measure an original 71 Corvette and found that the driveshaft is basically horizontal with the frame rails. Which means the diff is probably close to horizontal. Last edited by 84rzv500r; 06-27-2017 at 11:51 AM..